Our most recent trip to Sakai of Hiroshima produced a number of quality 5-6 inch fingerlings. 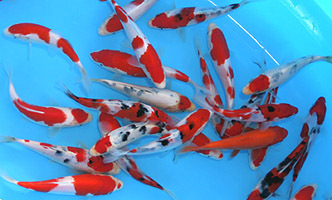 Varieties include Kohaku, Sanke, Showa, These koi have just come out of quarantine and are available for immediate shipment. Prices start at $50 each. Call 1-800-827-5819 or email us for more information. Make sure you check out our Koi Sales page for more new arrivals from Sakai of Hiroshima as well as many other farms.